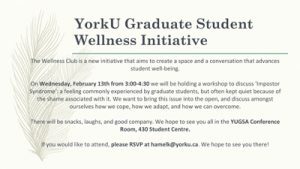 The Wellness Club is a new student-led initiative that aims to promote student well-being through workshops and activities that encourage and normalize work-life balance and self-care among graduate students at York. Join the Wellness Club for a student-led workshop on coping with and overcoming ‘Impostor Syndrome' on Wednesday February 13th (3:00-4:30) in the YUGSA Conference Room, 430 Student Centre. Please RSVP to hamelk@yorku.ca by February 10th.